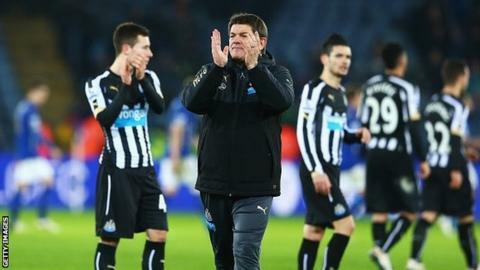 Newcastle caretaker boss John Carver says he is interested in taking over as head coach on a permanent basis. Carver, 49, has been in temporary control of first-team affairs at Newcastle in the wake of Alan Pardew's protracted departure to Crystal Palace. With Pardew's move now completed Carver spoke of his ambition to replace him after their FA Cup defeat to Leicester. "I'm going to throw my hat into the ring. I told the players but I couldn't make it public - now I am," he said. "Alan has gone now, it's been announced. At the time when all that was going on it's difficult to say how you feel. "But obviously deep down inside I want to be head coach of this football club." Carver, who is in his second spell with Newcastle having previously been assistant to Sir Bobby Robson, also revealed he has yet to speak to owner Mike Ashley about the position. Derby County manager Steve McClaren and Hull City boss Steve Bruce have both ruled themselves out of the running for the job.